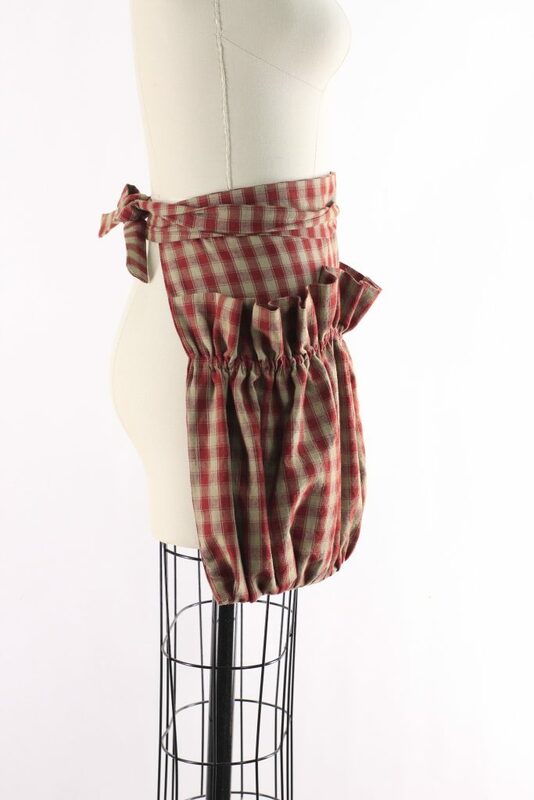 We make aprons for the work you do. Some of the work allows you to stay clean and pretty, some of it takes you into the mud and dirt, some of it takes you into the chicken coop. We celebrate all the places work is done around the home. And as the years pass, it’s interesting to see the changes in our customers. You not only buy more aprons, you want a better fit, you want options that meet the requirements of your chores. And now more of you are gardening, and even more own chickens. Egg collecting, berry picking and harvesting veggies for dinner are very big right now. You tell us you want more options. We are happily working on this keeping in mind the work of gathering eggs, berries and vegetables. Options are multiplying. We are starting with our Ruffled Garden Apron. We are making it wider to wrap your hips further than it did. It was 24″ across but the new version will be 30″. And we are adding more top stitching the ruffle more as we want you to be able to stuff the pockets as far as they will go. 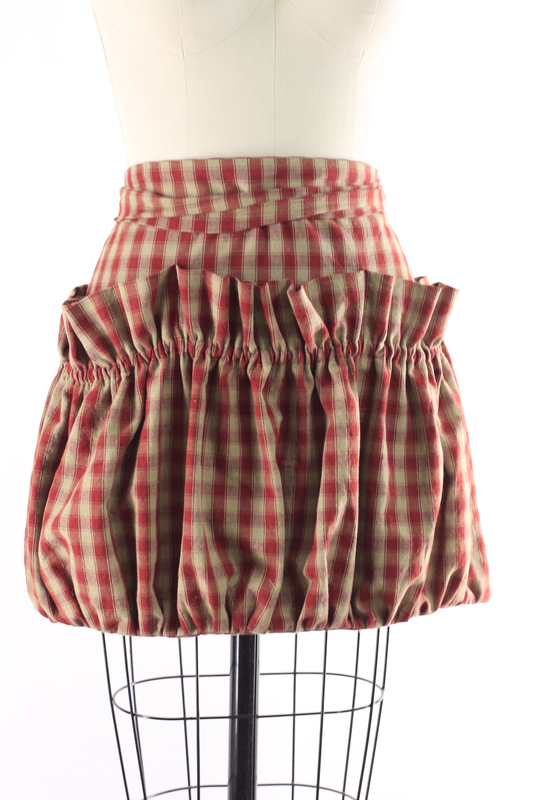 The ruffle is smaller yet still an important part of the design as it provides ease when reaching in and out of the pockets. It is being crafted in the denims we carry but will also be offered in more homespun colors as well. Here’s a peek at what we have so far. 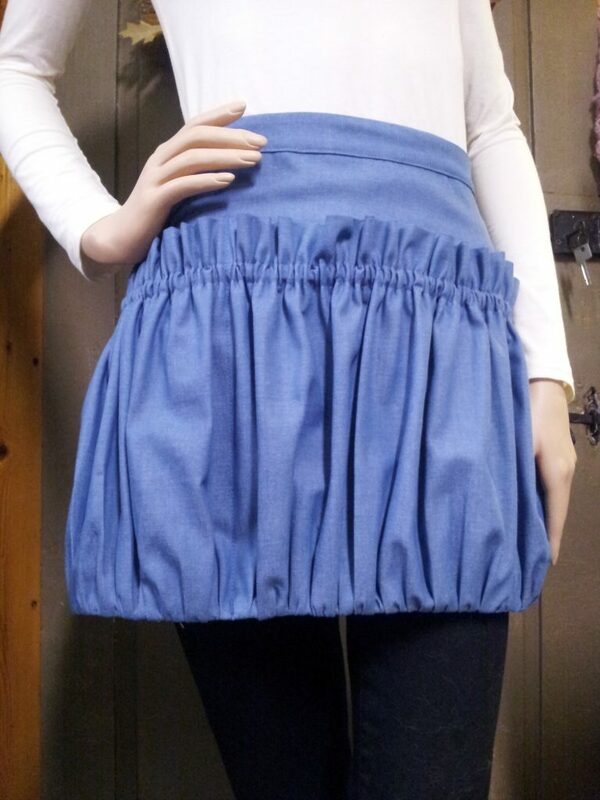 We thank our mannequin, Betty, for being a quick on the spot model for our first Denim Ruffled Gathering Apron. We hope it will serve you well. It’s certainly fun to make.